5 channel analog synthesizer with bassdrum, snare and 3 toms. Each channel features a unalterable factory sound and a variable user sound. It came at the same time with the SDS 7 as its cheaper alternative. 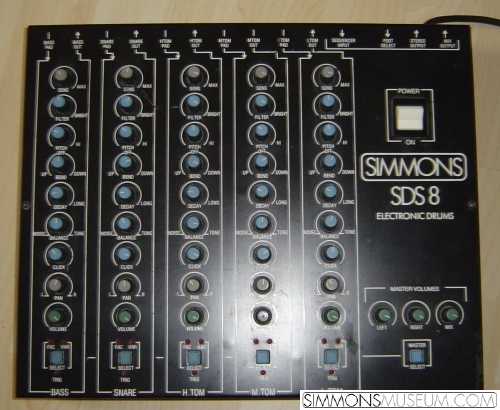 The SDS 8 comes with the same analog filters of its predecessor, the SDS 5. Every knob on the metal chassis is easliy accessable. 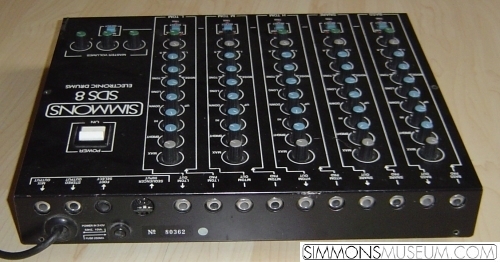 If you are looking for the classic analog Simmons sound with access to all the nice filters forgoing luxury like user banks, midi or modularity, this is the right machine for you.